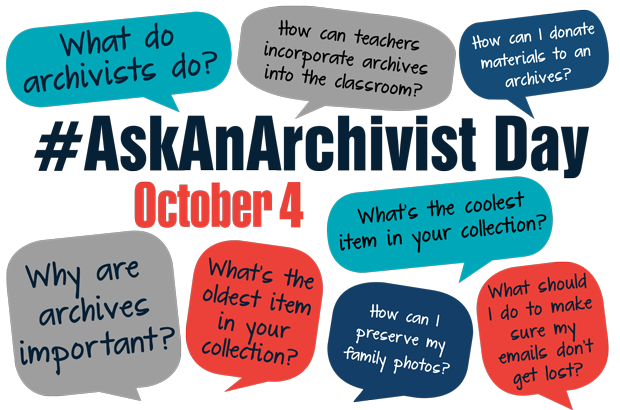 October 4th is Ask An Archivist Day! On October 4, archivists around the country will take to Twitter to respond to questions tweeted with the hashtag #AskAnArchivist. Take this opportunity to engage via your personal and/or institutional Twitter accounts and to respond to questions posed directly to you or more generally to all participants. PROMOTE #AskAnArchivist Day among your users and constituents via your institution’s website, Twitter account, blog, newsletter, and any other mediums available to you. Click here for the public announcement (and feel free to pick up language from it for your own promotions). Memes are a great way to drum up excitement and are easily created through an online meme generator. Check out examples of last year’s promotional “Philosoraptor” memes here and here. Happy #AskAnArchivist Day! Our archivists are waiting for YOUR questions. Tag us at @TWITTERHANDLE and use #AskAnArchivist. Archivists at @TWITTERHANDLE are gearing up for #AskAnArchivist Day on October 4! Literally—documents and photo boxes stacked and waiting! ENCOURAGE the public to use #AskAnArchivist and your institution’s Twitter handle (e.g., @smithsonian) when asking questions so you won’t miss any that are intended for you and so we will be able to track questions and answers to measure overall participation. TALK to your staff and colleagues to develop a plan for responding to tweets throughout the day. Will one person respond to all tweets? Will you share the task? Will individuals sign up for time slots and let the public know who will be available when? CREATE an institutional Twitter account if you don’t already have one. #AskAnArchivist Day and American Archives Month are both great opportunities to start one! Click here to get started. And if an institutional Twitter account is not an option for you, answer questions from your personal Twitter account! If your institutional affiliation and job title are not already listed on your profile, be sure to add that for the duration of #AskAnArchivist Day. If you plan to participate, please email SAA Editorial and Production Coordinator Abigail Christian with your Twitter handle so we can create a list of participants. TWEET and GREET! Take advantage of this opportunity to join with archivists from around the country to talk to and hear directly from the public on October 4.